Cankarjev dom – Cultural and Congress Centre Ljubljana received a gold Meetings Star Certificate 2018 in the category of the best Convention Centres. Cankarjev dom – Cultural and Congress Centre Ljubljana (CD), one of the two Ljubljana’s largest convention centres, has been awarded the Meetings Star Certificate of Excellence also for the year 2018. The Meetings Star awards and certificates, for the 11th year conferred by Kongres Magazine and Conventa, are given to the best meeting destinations, hotels and convention centres of New Europe. 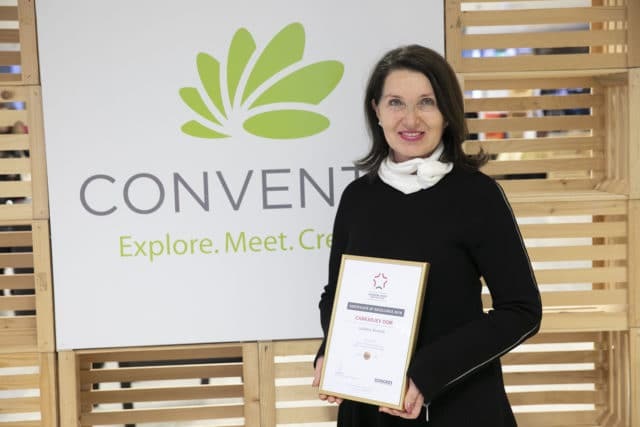 This year, the awards and certificates were publicly announced during the Meetings Star Award ceremony that was held on the opening night of Conventa trade show on the 22nd of January 2019. The ceremony was held in Cankarjev dom’s Kosovel Hall. The Hidden Congress Guest evaluation ranked Cankarjev dom in the Gold Meetings Star Certificates of Excellence among the best Meeting Convention Centres where the convention centres that reached between 4.81 to 5.00 points were ranked. Cankarjev dom received 4.87 points and was, thus, one of the highest ranked convention centres of New Europe. Gorazd Čad, editor-in-chief of Kongres Magazine, presented the certificate to Breda Pečovnik, Cankarjev dom’s congress and commercial programme director. Cankarjev dom – Cultural and Congress Centre Ljubljana (CD), located in the centre of Slovenia’s capital within the main modernist square and neighbouring all the state’s major instituions – the Parliament, the Governmental Palace, and the Presidential Palace – , has been for almost 40 years the legendary institution and a synonym for cultural and humanistic activities and meetings industry in Slovenia. In CD, the cultural-artistic programme and congress activity have been excellently complementing each other at all times of operation. All of this places the CD among one of the highest quality and most interesting convention centres in Europe. CD is also the only Slovenian member of IAPCO. PCO agency of the CD can be compared to the largest congress organizers in the world. About their experiences speaks also the fact that CD carries out more than 200 events per year, and in scope of those also more than 1,000 smaller events.